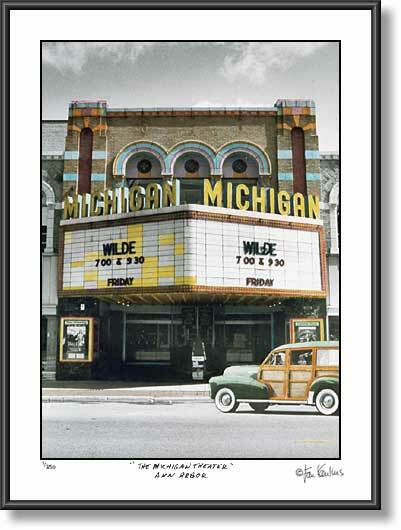 MICHIGAN THEATRE photo picture - ANN ARBOR, MICIGAN Michigan Theatre art picture photo print: This Michigan Theatre picture photo of The Ann Arbor Michigan Theatre is made from an original hand-colored black and white photograph of this University of Michigan campus landmark. The Ann Arbor Michigan Theatre, shown in this hand-colored photograph, was built in 1928 with a seating capacity of 1700. The Michigan Theatre is well know for it's esoteric venue of art movies, plays, and live music performances. This Michigan Theatre photo shows a vintage "Woody" in front of the Michigan Theatre. This Ann Arbor Michigan Theatre picture photo is historic in view of the fact that the marquee seen in this picture has been torn down and replaced by a tall vertical marquee that reads "MICHIGAN". PLEASE SEE THE OTHER ANN ARBOR PHOTOGRAPHS AVAILABLE ON THIS WEBSITE BY CLICKING ON THE 'GO BACK TO...' LINK ABOVE THIS PHOTO NEAR THE TOP OF THIS PAGE. STOP BY AND SEE ARTIST PHOTOGRAPHER JAN KAULINS HAND COLORED BLACK AND WHITE ANN ARBOR, UofM, AND DETROIT PHOTOS FOR SALE AT HIS BOOTH #144, ON STATE ST. JUST SOUTH OF WILLIAMS ST. BY THE DIAG AT THE ANN ARBOR ART FAIR ON JULY 20-23, 2005. ANN ARBOR ART FAIR ARTIST EXHIBITOR PHOTOGRAPHER BOOTH #144.